You have the dream. You want to take it to the next level. What stops you? Do you know, deep down in your heart of hearts, that there’s this brilliant life calling you… WAITING for you… but you just don’t know how to get there? Do you feel on fire one day, and defeated the next? Or overwhelmed with all you “should be” doing? Are you ready to break free from the shackles of constraint, self-imposed or otherwise, and free your mojo to finally fly… to experience the freedom, true expression, and security … that you so rightly deserve? This is the holy grail of success. And it is within your reach. 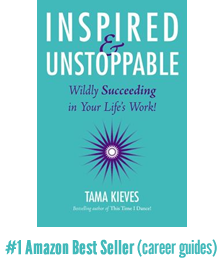 In her nationally best-selling book Inspired & Unstoppable: Wildly Succeeding in Your Life’s Work former Harvard-trained attorney turned visionary career/success coach, Tama Kieves helps you listen to your own radically inspired way to succeed. You don’t need “the steps” when you’re moved. With her unique brand of intelligent spirituality underscored with practicality and edgy humor, Kieves coaches you through any difficulty and teaches you how to become an unstoppable warrior for your life’s work and desires– and succeed like never before. 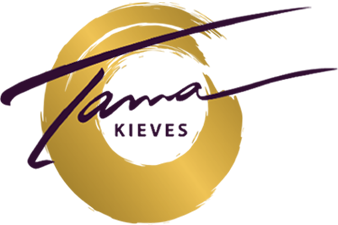 Tama has the ability to reach high-powered professionals and creative souls alike and provide them with fresh tools, inspiration, and practical actions that take her huge promise and deliver it as though she were guiding and coaching you directly into your own unimaginable success. Sign Up – Free gift with purchase! You can’t plan an inspired life, you have to live it – the less you try and force your vision of how things should work and start living from deep within your creative truth, the more likely you are to experience inspired success. Any road can take you in the right direction – when you access your place of inner inspiration and act from there, any move is the right one… but standing on the sidelines will get you nowhere. You WILL have your people – there will be people who need what you have to give, and who are on “assignment” to take your dreams to the next level. Inspired time knows no deadlines – there’s a big difference between getting things done and feeling complete.